Barrel Stave Console & 2 Pub Stools Set (p/n 17719). 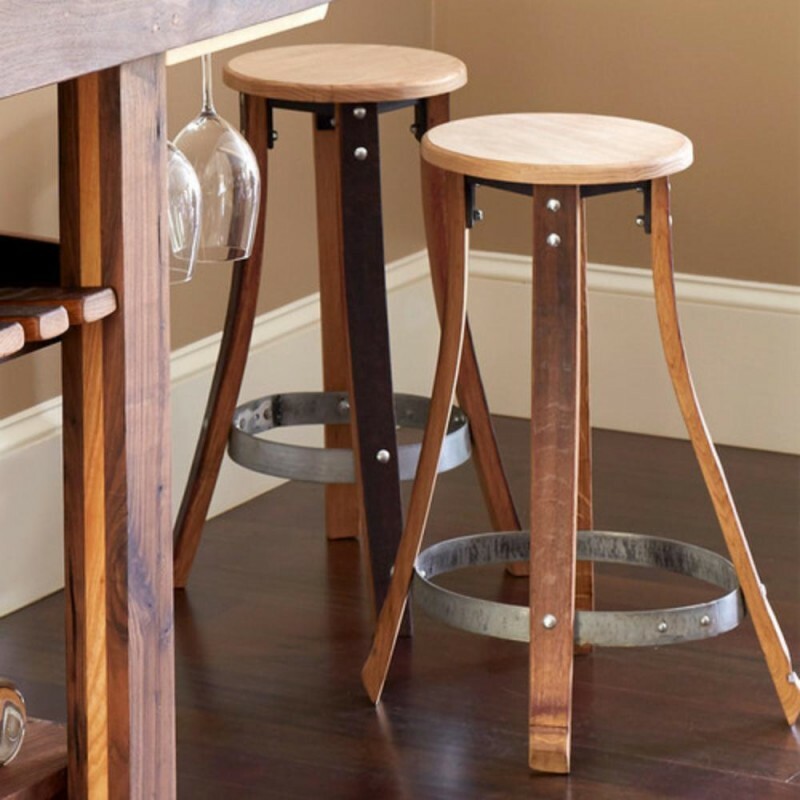 Beautiful, functional and authentic, this 3-level barrel stave console and pub stools set is designed for entertaining on special occasions as well as everyday storage. On the top surface, each console features a unique composition of reclaimed wine barrel staves and their markings that creates a masterful and enduring beauty. On the second level, the center of the console features strips of staves provide storage for up to 10 unstacked wine bottles, while both cantilevered ends provide hanging storage for up to 12 Bordeaux-size wine glasses. 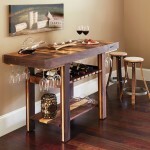 The bottom level features extra-tall storage space for your choice of beverages, glassware and accessories. Because the barrels are reclaimed, each rack will have its own character, personality, and imperfections. The console is treated with 6 coats of tung oil to protect against spills and enhance its natural beauty. 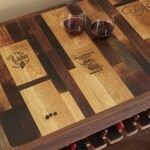 For upkeep, oil annually with a lightweight orange or lemon oil, more for the tabletop surface if desired. Dry dust or hand wipe with a damp cloth to clean. The stools are handmade from reclaimed wine barrels, and feature a lightly toasted wine stain applied to the wood seat. Due to variances among barrels, dimensions may vary by up to 1 1/2 inches. Handcrafted from reclaimed wine barrel staves, the console includes an elaborate patchwork of recycled oak staves with authentic barrel markings with ample storage space for wine bottles, glasses and other accessories. This set includes bundled pricing and does not qualify for additional discounts or promotions.